Step 1 In a large pot, sweat the shallots, leeks and onions in butter until completely soft. Add the diced potatoes and enough water to cover. Bring the water to a simmer and cook until the potatoes are tender. Add the cream and simmer an additional 20 minutes. Step 2 Transfer the soup in three batches to a blender and puree, adding one tablespoon of creme fraiche to each batch. Once pureed, pass the soup base through a fine chinois into a bowl, then cover and refrigerate until chilled. Step 3Taste each cucumber to ensure that there is no bitter flavor. Cut the cucumbers into chunks, combine with mint leaves and then pass through a juicer; you should have at least 1 1/2 cups juice (save any extra for another use). When the soup base is completely chilled, combine it with the 1 1/2 cups cucumber juice and season to taste. In Recipes-list.com we have selected the most viewed recipes from category - Appetizers Soups Vegetarian . Enjoy the best recipes specially selected for you! 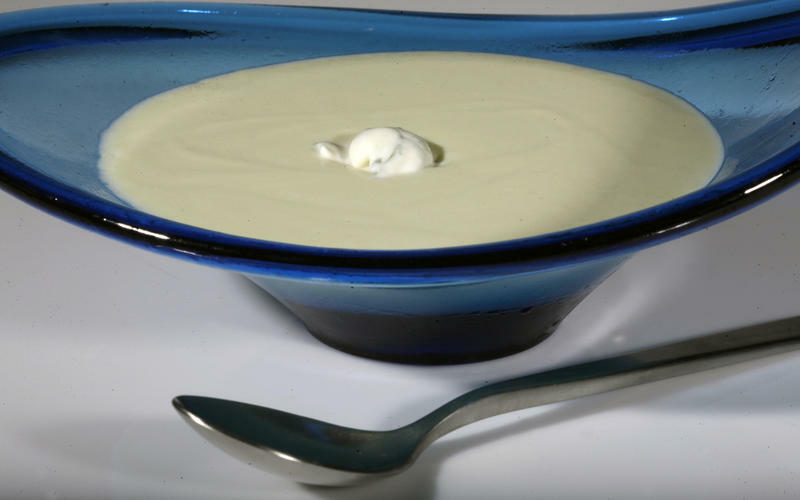 Cucumber vichyssoise is the right choice that will satisfy all your claims.